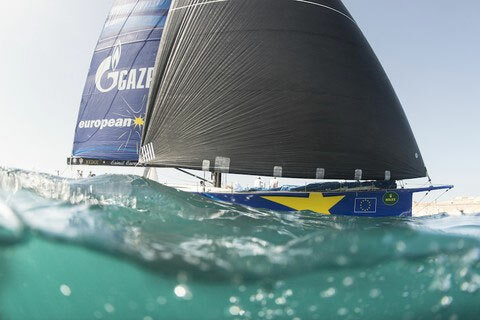 Igor Simicic's maxi, Esimit Europa 2 is expected to finish the Rolex Middle Sea Race in the early hours of tomorrow morning. However the 100ft carbon fibre canting keel Maxi is under serious pressure to secure their fourth Line Honours victory in the race. At dawn this morning, Niklas Zennstrom's Maxi 72, Ran V was just six miles behind Esimit Europa 2 at Pantelleria with 190 miles to go. Esimit Europa 2 is the quicker of the two yachts in a straight line but the wind is now directly behind the two yachts. To maintain the best speed to the finish, both yachts will be continuously gybing to maximise their VMG (Velocity Made Good). In theory, Ran V is the quicker yacht in this 'short course' battle because the yacht is far more manoeuvrable than her bigger rival. What is more, this evening a substantial increase in wind speed is expected. This should arrive at Ran's position first, narrowing the gap on Esimit Europa 2. This morning in Malta, it is hot and humid with a significant amount of dense cloud, this kind scenario often creates thunderstorms. These cells of high energy can create squalls with a significant wind speed, which the two yachts could hook into. Should Esimit Europa 2 take Line Honours, it will be for the fourth time, which has never been accomplished before but Ran V poses a serious threat. Last night bereft of wind, The Tyrrhenian Sea, north of Sicily would have been an eerie place. Last year's overall winner, Italian TP52 B2, skippered by Michele Galli, has led the fleet so far. However at about 22:00 last night, two Italian Cookson 50s ghosted past B2. Germana Tognella's Cantankerous and Vincenzo Onorato's Mascalzone Latino. However, Paolo Semeraro's Neo 400, Neo Bank Sails took up a southerly position during the night and is still the provisional class leader. Josef Schultheis and Timmy Camilleri XP-ACT Bank Sails is the new the on-the-water leader. The leader at Stromboli, Italian Adria 49, Ars Una, skippered by Alberto Nunziante, has taken a position 3 miles south of XP-ACT Bank Sails and will need to tack to make Favignana. Whilst Eric De Turckheim's French A13, Teasing Machine and Bastiaan de Voogd's Sydney 43, Coin Coin have taken up a position nine miles north of the leader and should be able to lay the north west corner of the course. One of the big gains over night was made by Rolf Auf der Maur's DK46, Kajsa III. The front runners in IRC 3 are about 80 miles from Favignana. Aaron Gatt Floridia's Maltese J/122, Otra Vez was the overall leader of the Rolex Middle Sea Race at Stromboli. However, their local rivals, J/122 Artie skippered by Lee Satariano had a very good night. Artie passed Otra Vez around midnight. Otra Vez tacked south and Artie covered them from the front and both yachts are now heading for the Sicilian coast, presumably looking to benefit from more wind as the land heats up during today, but for the moment, it looks as though Artie has the upper hand. The youngest Double Handed team in the race, Matthew Scicluna and Lee Gauci racing Maltese Falcon II have shown great guile for two sailors so young. At Stromboli, the Maltese sailors, who are both in their 20s, gave the Volcanic island a wide birth, taking the most northerly track of any of the competing yachts and this morning Maltese Falcon II is leading the class on the water and heading for Favignana. Matthew Scicluna and Lee Gauci still have 355 miles to go. Enrico Calvi's Italian Dufour 34, Duffy is still the provisional leader after time correction.